Amarilli vezzosa (which also has the title ‘Il duello amoroso’) was composed and performed near the end of August 1708. It is one of a number of cantatas which survive only in manuscripts in the Santini collection at Münster and which are still unpublished. The singers are soprano and alto (it is Handel’s only cantata for this combination) and the accompaniments are for a small group of first and second violins with continuo. The ‘amorous duel’ is an encounter between the shepherd Daliso (the alto) and the shepherdess Amaryllis: it seems she had once pledged her love to him but has now changed her mind. They meet in a wood. Daliso, resentful at being rejected, decides to use force to gain his desire. Amaryllis warns him that no lasting pleasure can be obtained from an act of violence. When Daliso ignores the warning and still seems determined on his object, Amaryllis produces a dagger and symbolically demands that he satisfies himself by plunging it into her heart. At this piece of melodrama Daliso’s will promptly collapses and he begs forgiveness. He gets none: Amaryllis mockingly hints that she would have relented if he had been a little bolder and, while Daliso rebukes her for her heartlessness, goes on to say that his love could never set her on fire. Though neither character emerges very sympathetically, the music is always engaging. The opening sonata has a brilliant first movement which perhaps represents Daliso chasing Amaryllis through the wood. In the first aria, for Daliso, the main tune in minuet rhythm is extended by a leaping figure in the violins (hinting at the character’s impetuousness? ), later taken up in the vocal line. The easygoing tune of Amaryllis’s first aria expresses her carefree confidence: Handel was especially fond of it and used it in several later works, notably Agrippina (‘Col peso del tuo amor’) and Flavio (‘Ricordati, mio ben’). Amaryllis’s next aria is an exciting piece: the text speaks of a sailor ceasing to fear the waves of the sea, but the rushing semiquavers in both violins and voice seem to depict him being driven before the tempest. In the last aria Daliso’s hopelessness is conveyed in the broken-up melodic line of a sad siciliana, given extra pathos at the cadences by the use of the ‘Neapolitan sixth’ (A flat in the key of G minor), a favourite device in the music of Handel’s Italian period. The closing duet in A minor (later to be adapted by Handel in the finale of Poro) is a strict minuet, studiously neutral in tone. O come chiare e belle is an ‘occasional’ piece directly connected with Ruspoli’s involvement in the War of the Spanish Succession. Pope Clement XI had accepted the Bourbon claimant, Philip V, as King of Spain, thereby rejecting the claim of the Habsburg Archduke Charles and drawing upon himself the wrath of Charles’s brother, the Emperor Joseph I of Austria. In June 1707 Imperial troops secured the kingdom of Naples for the Habsburg cause and, as Milan was already under Austrian rule, the Pope was put into a highly vulnerable position. In May 1708 Imperial troops occupied the Papal town of Comacchio on the Adriatic coast, threatening the annexation of nearby Ferrara and other Papal territories. The Pope protested without effect. By August he was left with no choice but to raise his own troops to defend Ferrara and, if possible, regain Comacchio. The ambitious Ruspoli promptly offered assistance by forming a regiment of 1200 men. Ferrara was duly defended (though Comacchio remained occupied until the end of the war) and Ruspoli received his hoped-for reward by gaining the title of Prince of Cerveteri in February 1709. 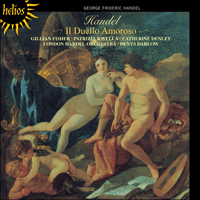 Handel’s cantata was performed on 9 September 1708 and celebrates the moment when Ruspoli offered to come to the Pope’s aid. There are three characters. The shepherd Olinto (soprano) represents Ruspoli himself (Olinto was his ‘Arcadian’ pseudonym); the river Tiber (alto) represents Rome, and the allegorical character of Glory (soprano) appears to inspire Rome to renew her ancient greatness. In the imagery of the text this renewal is to be accomplished under the guidance of a ‘clement star’ who is, of course, Pope Clement himself. There are probably several topical allusions which are now obscure, but it may be noted that the references to ‘alba’ (‘dawn’) also allude to Clement (whose family name was Albani) and the rivers Ister and Orontes represent the Austrian and Turkish Empires. (‘Ister’ is the classical name for the Danube; the Orontes was the chief river of Syria. Though Turkey was not directly involved in the war at this time she was a perennial enemy of the Papacy.) The mention of the ‘lance of Jupiter united with Mars’, coupled with the statement that Urania and Clio (the muses of astronomy and history) cannot lie, suggests that there was a conjunction of the two planets at this time, but there was none between July 1707 and September 1709. The music is full of spirited invention. A brisk and brief opening sonata leads directly into Olinto’s first aria; the image of the waters of the Tiber shimmering in the light of the ‘clement star’ is evoked by delicate overlapping figures in the violins. The Tiber’s awakening (‘Chi mi chiama?’) is accompanied by a bass line in dotted rhythm which Handel later put to good use in Alcina, and the vigorous G minor aria that follows (‘Più non spera) was rightly rescued for Il Pastor Fido. Glory’s first utterance is, surprisingly, a slow aria with a highly embellished vocal line, gently rebuking Rome for its dejected state. Brilliance returns in ‘Tornami a vagheggiar’, which marks the first appearance of the radiant tune best known from the aria in Alcina beginning with the same words. (The ritornellos were used for the aria ‘E pur bello’ in Teseo.) Olinto’s next aria refers to the alarms of war arousing Rome’s ancient heroes, but to avoid anticipating his climax Handel declines to use the obvious imagery and sets it as a formal minuet. After Glory has ecstatically praised the ‘clement star’ Olinto declares he will change his shepherd’s pipes for the trumpet of war and, with splendid effect, Handel adds a real trumpet to the score for the final aria. A brief coro for the three singers concludes. C’est en 1706 que Haendel quitta son Allemagne natale pour la première fois à destination de l’Italie où il demeura environ quatre ans. Il entamait ainsi l’une des périodes les plus importantes et les plus fructueuses de sa vie. Grâce à Friedrich Wilhelm Zachow, le professeur qui l’avait suivi à Halle, il avait acquis une technique générale approfondie, telle que tout musicien d’Allemagne destiné à servir l’église se devait d’avoir. En composant et jouant pour l’opéra de Hambourg, Haendel avait aussi indirectement reçu quelques impressions des styles français et italien. C’est pour réaliser son ambition de devenir un compositeur d’opéra de premier ordre qu’il partit pour l’Italie—il y acquit un savoir poussé de la langue, travailla avec des chanteurs et instrumentistes italiens et absorba dans ses propres compositions la couleur et le drame des musiques italiennes les plus récentes. Ce qu’en Italie Haendel souhaitait perfectionner avant tout, c’était son écriture pour la voix. Si les conditions agitées et parfois acrimonieuses qui régnaient parmi les théâtres lyriques ne s’y prêtaient guère, le cadre plus calme et plus accueillant des grandes propriétés de la noblesse de Rome et d’ailleurs lui était nettement plus favorable. A cette époque, l’exécution de cantates pour voix seule, ou pour plusieurs voix, était une forme usuelle de divertissement domestique à travers laquelle les poètes, compositeurs et chanteurs pouvaient briller et raffiner leurs talents. Si elles étaient généralement écrites pour voix seule et continuo, pour des événements particuliers, elles étaient élargies et dotées d’un accompagnement instrumental qui pouvait atteindre la taille d’un opéra miniature. En Italie, embrassant un vaste registre de genres, Haendel écrivit une centaine de ces cantates grâce auxquelles il gagna l’expérience dont il avait besoin. Il produisit de surcroît un flot de musique merveilleuse où il puisera bien des fois à la recherche d’idées nouvelles. Essentiellement écrites pour le Marquis Ruspoli, le mécène romain le plus important de Haendel, les cantates étaient exécutées lors des «Académies arcadiennes», une société réunissant des gentilshommes et des artistes qui mettaient toute leur énergie au service de réalisations culturelles de haute tenue, plus particulièrement dans les domaines de la poésie et de la musique. Ruspoli était un des membres influents du groupe. Il en présidait d’ailleurs les rencontres lorsqu’elles se tenaient chez lui, au Palais Bonelli, à Rome. Haendel passa six mois avec Ruspoli en 1707. Il le retrouva au printemps 1708 quand il produisit son œuvre majeure de cette période romaine, l’oratorio La Resurrezione. Le début de l’été fut consacré à un séjour à Naples et Haendel revint une dernière fois le Palais Bonelli en août et septembre. Les comptes de la maisonnée Ruspoli révèlent de nombreux détails sur les gages payés aux musiciens et aux copistes. Ils nous permettent aussi de déduire que les deux cantates les plus longues de ce disque furent écrites durant la dernière période que Haendel passa avec Ruspoli en 1708. Clori, mia bella Clori n’est pas mentionnée spécifiquement dans les comptes, mais il s’agit certainement d’une œuvre romaine (il existe une copie de la main d’Angelini, le principal copiste de Haendel à Rome). Elle pourrait bien être la cantate sans titre exécutée comme conversazione le 26 juin 1707 pour laquelle deux violonistes furent engagés. Egalement intitulée «Il duello amoroso», Amarilli vezzosa fut composée et exécutée à la fin du mois d’août 1708. Il s’agit d’une des nombreuses cantates à n’avoir survécu que sous forme manuscrite dans la collection Santini à Münster. Encore inédite de nos jours, elle est écrite pour soprano et alto—la seule cantate de Haendel pour cette combinaison—et pour un petit groupe de premier et second violons avec continuo. Le «Duel amoureux» se trouve être une rencontre entre le berger Daliso (alto) et la bergère Amaryllis: il y a bien longtemps de cela, Amaryllis lui aurait juré amour éternel avant de se raviser. Les deux se rencontrent dans les bois. Nourrissant un profond ressentiment après avoir été repoussé, Daliso décide d’utiliser la force pour satisfaire son désir. Amaryllis le prévient qu’il n’existe pas de plaisir durable obtenu par la violence. Ignorant ses mises en garde, Daliso semble plus déterminé que jamais à la vaincre. C’est alors qu’Amaryllis tire un poignard et lui demande symboliquement qu’il se satisfasse en le lui plongeant dans le cœur. En cet instant digne du mélodrame, la volonté de Daliso disparaît rapidement. Il la supplie de lui pardonner. Mais aucun pardon n’est de mise: moqueuse, Amaryllis laisse entendre qu’elle aurait cédé s’il avait été un peu plus audacieux. Tout en la maudissant pour son cœur de marbre, Daliso relève que jamais son amour ne pourra embrasser le sien. Si aucun des personnages ne sort grandi de l’histoire, la musique demeure toujours d’une grande séduction. La sonate initiale possède un premier mouvement brillant qui représente peut-être Daliso chassant Amaryllis à travers les bois. Dans la première aria dévolue à Daliso, la mélodie principale écrite dans un rythme de menuet est amplifiée par un motif intervallique aux violons (serait-ce une évocation de l’impétuosité du personnage?) repris ultérieurement à la voix. La mélodie fluide du premier air d’Amaryllis traduit sa confiance insouciante: Haendel l’aimait particulièrement et s’en servit par la suite à plusieurs reprises notamment dans Agrappina («Col peso del tuo amor») et Flavio («Ricordati, mio ben»). L’aria suivante d’Amaryllis est une pièce séduisante: si le texte évoque un marin cessant de craindre les vagues de la mer, les élans de doubles croches aux violons et à la voix donnent plutôt l’impression de le voir fuir devant la tempête. Dans le dernier air, l’impuissance de Daliso est traduite par la ligne mélodique cassée d’une triste siciliana dont le pathos est accentué dans les cadences par l’emploi de la sixte napolitaine (la bémol dans la tonalité de sol mineur), une tournure privilégiée de la musique de la période italienne de Haendel. Le duo final en la mineur (adapté par la suite dans le final de Poro de Haendel) est un menuet rigoureux écrit dans un climat volontairement neutre. O come chiare e belle est une œuvre de circonstance associée directement à l’engagement de Ruspoli dans la Guerre de succession espagnole. Le Pape Clément XI avait accepté le prétendant au trône de la lignée des Bourbons, Philippe V, comme roi d’Espagne, rejetant de fait la demande de l’archiduc Charles pour les Habsbourg. Il s’attira la colère du frère de Charles, l’Empereur Joseph I d’Autriche. En juin 1707, les troupes impériales s’emparèrent du royaume de Naples pour le placer dans le giron de la cause habsbourgeoise dont Milan faisait déjà parie. Le Pape était donc placé dans une position des plus vulnérables. En mai 1708, les troupes impériales occupèrent la ville papale de Comacchio sur la côte de l’Adriatique, menaçant d’annexer Ferrare et d’autres territoires papaux voisins. Les protestations du Pape demeurèrent sans effet. En août, il ne lui restait plus d’autre choix que de lever sa propre armée pour défendre Ferrare et si possible regagner Comacchio. L’ambitieux Ruspoli offrit rapidement son soutien et réunit un régiment de 1200 hommes. Ferrare fut dûment défendue (Comacchio demeura occupée jusqu’à la fin de la guerre) et Ruspoli reçut la récompense qu’il attendait en étant fait Prince de Cerveteri en février 1709. La cantate de Haendel fut exécutée le 9 septembre 1708 pour célébrer le moment où Ruspoli offrit de voler au secours du Pape. Elle est écrite pour trois personnages : le berger Olinto (soprano) incarne Ruspoli (Olinto était son pseudonyme «arcadien»), la rivière Tiber (alto) représente Rome et le personnage allégorique de Gloire (soprano) apparaît pour convier Rome à renouer avec son ancienne grandeur. Dans l’imagerie de ce texte, ce renouveau s’accomplit sous les auspices d’une «étoile clémente» qui bien entendu n’est autre que le Pape Clément. Il existe probablement plusieurs allusions liées à l’actualité de l’époque qui sont maintenant perdues. Il faut cependant noter que les références à l’aube, «alba» font allusion à Clément (dont le nom de famille était Albani) et que les rivières Ister et Orontes représentent les empires autrichien et turc. («Ister» est le nom classique du Danube tandis que l’Orontes était le fleuve principal de Syrie. Si la Turquie n’était pas directement engagée dans ce conflit, elle n’en demeurait pas moins l’ennemi perpétuel de la Papauté.) La mention de la «lance de Jupiter unie avec Mars» associée à l’affirmation que Urania et Clio (les muses de l’astronomie et de l’histoire) ne peuvent se reposer, suggère une conjonction des deux planètes, bien qu’il semble qu’aucune n’ait eu lieu entre juillet 1707 et septembre 1709. La musique fait preuve d’une invention pleine d’esprit. Une sonate initiale allante et concise conduit directement au premier air d’Olinto; l’image des eaux du Tibre scintillant à la lumière de «l’étoile clémente» est évoquée par de délicats motifs qui se chevauchent aux violons. Le Tibre s’éveille («Chi mi chiama?») sur un accompagnement en rythme pointé de la ligne de basse—Haendel s’en servit à nouveau dans Alcina—et l’air vigoureux qui s’ensuit, en sol mineur («Piu non spera») fut sauvegardé—à juste titre d’ailleurs—de Il Pastor Fido. Tançant gentiment Rome de son piteux état, les premiers mots de la Gloire se font sur une aria lente dotée d’une ligne vocale hautement ornée. Le brio réapparaît dans «Tornami a vagheggiar» qui marque le premier énoncé de la mélodieux radieuse plus connue sous l’air de Alcina débutant par les mêmes mots. Les ritornellos furent exploités dans l’air «E pur bello» de Teseo. S’ensuit un air d’Olinto qui évoque les prémonitions de guerre s’élevant des anciens héros de Rome, et évite d’anticiper tout paroxysme. Haendel se refuse à exploiter les imageries auxquelles on penserait d’emblée et préfère le mettre en musique sous la forme d’un menuet. Après que Gloire a délivré ses louanges extatiques à «l’étoile clémente», Olinte déclare qu’il changera les flûtes des bergers pour les trompettes de la guerre, et avec un effet splendide, Haendel ajoute une vraie trompette à la partition de la dernière aria. Cette œuvre prend fin sur un coro concis des trois chanteurs. Händel verließ seine deutsche Heimat zum ersten Mal im Jahre 1706, als er nach Italien reiste, um dort etwa vier Jahre lang zu bleiben. Es war dies eine der wichtigsten und fruchtbarsten Perioden seines Lebens. Von seinem Hallenser Lehrer Friedrich Wilhelm Zachow hatte er eine gründliche technische Ausbildung als Kirchenmusiker erhalten. Als er im Dienste der Hamburger Oper komponierte und spielte, gewann er einen Eindruck des französischen und des italienischen Stils, jedoch nur durch zweite Hand. Um seinem Ehrgeiz Genüge zu tun, ein erstrangiger Opernkomponist zu werden, musste er sich nach Italien aufmachen, um dort die nötigen Sprachkenntnisse zu erwerben, mit italienischen Sängern und Instrumentalisten zu arbeiten und die Farben und das Drama der neuesten italienischen Musik in seine Kompositionen aufzunehmen. An erster Stelle wollte Händel in Italien seine Fähigkeiten im Komponieren für die Stimme vervollkommnen. Diesen Vorsatz konnte er jedoch im hektischen und manchmal zänkischen Opernbetrieb nicht besonders gut verwirklichen, sondern viel eher in der ruhigen und angenehmen Umgebung der großen Anwesen der adeligen Musikmäzene von Rom und anderenorts. In dieser Zeit wurden Kantaten für Solostimme oder für mehrere Stimmen oft in einem häuslichen Rahmen aufgeführt, wobei Dichter, Komponisten und Sänger ihre Talente zur Schau stellen und sie gleichzeitig verbessern konnten. Die meisten Kantaten wurden für nur eine Stimme mit Continuo-Begleitung geschrieben, während größere Kantaten mit Instrumentalbegleitung (zuweilen mit dem Umfang einer Minioper) besonderen Anlässen vorbehalten waren. Händel komponierte etwa hundert solcher Kantaten in Italien: sie decken die volle Bandbreite des Genres ab. Durch die Arbeit an ihnen sammelte er die Erfahrungen, die er brauchte, und brachte gleichzeitig eine ganze Flut von herrlicher Musik hervor, an die er sich später oft wenden sollte, wenn er Inspirationen für neue Werke suchte. Viele seiner Kantaten schrieb Händel für seinen wichtigsten römischen Förderer, den Marchese Ruspoli. Sie wurden bei den Zusammenkünften der „Arkadischen Akademie“ aufgeführt, einer Gesellschaft von Aristokraten und Künstlern, die sich für einen hohen kulturellen Leistungsstandard in Rom, besonders in der Poesie und Musik, einsetzten. Ruspoli war ein führendes Mitglied dieser Gruppe und hatte den Vorsitz, wenn die Treffen in seinem Hauptanwesen (dem Bonelli-Palast) in Rom stattfanden. Händel verbrachte im Jahre 1707 sechs Monate bei Ruspoli und kehrte im Frühling 1708 zurück, um sein großes, für Rom konzipiertes Werk, das Oratorium La Resurezzione, aufzuführen. Den Frühsommer verbrachte er in Neapel und kehrte dann ein letztes Mal im August für zwei Monate zum Bonelli-Palast zurück. In Ruspolis Haushaltsbüchern sind die Zahlungen an Musiker und Kopisten bis ins Einzelne festgehalten. Aus diesen Eintragungen wird ersichtlich, dass die beiden längsten Kantaten der vorliegenden Aufnahme während Händels letzten Aufenthalts bei Ruspoli im Jahre 1708 entstanden sind. Clori, mia bella Clori taucht in den Haushaltbüchern nicht auf, jedoch kann mit Sicherheit angenommen werden, dass es ein in und für Rom komponiertes Werk ist (es ist uns eine Abschrift von Angelini, Händels Hauptkopist in Rom, überliefert) und es könnte sich um die nicht weiter benannte Kantate handeln, die bei einer conversazione am 26. Juni 1707 aufgeführt wurde und für die zwei Violinisten eingestellt wurden. Amarilli vezzosa (das auch den Titel „Il duello amoroso“ trägt) wurde Ende August 1708 komponiert und aufgeführt. Es ist dies eine von mehreren Kantaten, die nur im Manuskript in der Santini-Sammlung in Münster überliefert und bis heute nicht veröffentlicht worden sind. Die Sänger sind ein Sopran und ein Alt (Händels einzige Kantate für diese Kombination), und die Begleitung wird von einer kleinen Gruppe von ersten und zweiten Violinen mit Continuo besorgt. Das „amouröse Duell“ ist eine Begegnung des Hirten Daliso (Alt) und der Hirtin Amaryllis: es scheint, als hätte sie ihm ihre Liebe versprochen, nun aber ihre Meinung diesbezüglich geändert. Sie treffen sich in einem Wald. Daliso ärgert sich über die Zurückweisung und versucht, seine Geliebte mit Gewalt zu erlangen. Amaryllis warnt ihn jedoch, dass sich wirkliches Glück nicht erzwingen lassen könne. Als Daliso diese Warnung ignoriert und weiterhin entschlossen scheint, zieht Amaryllis einen Dolch hervor und verlangt symbolisch von ihm, dass er sich befriedigen und ihr den Dolch ins Herz stoßen möge. In diesem melodramatischen Augenblick bricht der Wille Dalisos prompt und er fleht um Vergebung. Die wird ihm jedoch nicht gewährt: Amaryllis sagt spöttisch, dass sie nachgegeben hätte, wenn er etwas kühner gewesen wäre und, während Daliso sie für ihre Herzlosigkeit tadelt, dass seine Liebe sie nie entzünden konnte. Obwohl beide Figuren nicht besonders sympathisch erscheinen, ist die Musik doch immer reizvoll. Die Eröffnungssonata hat einen brillanten ersten Satz, der möglicherweise Dalisos Jagd Amaryllis’ durch den Wald darstellt. In der ersten Arie, die Daliso singt, wird die Hauptmelodie im Menuettrhythmus durch eine Springfigur der Violinen (die auf das ungestüme Handeln Dalisos anspielt?) erweitert und später auch von der Singstimme übernommen. Die recht einfache Melodie der ersten Arie von Amaryllis drückt ihr sorgloses Selbstbewusstsein aus: Händel mochte sie besonders und verwendete sie später in verschiedenen Werken wieder, etwa in Agrippina („Col peso del tuo amor“) und in Flavio („Ricordati, mio ben“). Die nächste Arie der Amaryllis ist ein aufregendes Stück: der Text erzählt von einem Matrosen, der die Wogen der See nicht mehr fürchtet, doch scheinen die rasenden Sechzehntel der beiden Violinen und der Singstimme ihn inmitten eines Sturms darzustellen. In der letzten Arie wird Dalisos Hoffnungslosigkeit mit Hilfe der gebrochenen Melodielinie einer traurigen Siciliana ausgedrückt, der bei den Kadenzen durch den Einsatz eines „neapolitanischen Sextakkordes“ (As in der Tonart g-Moll) noch mehr Pathos verliehen wird—ein vielgenutztes Stilmittel in der italienischen Musik Händels. Das Schlussduett in a-Moll (das Händel später für das Finale von Poro arrangierte) ist ein strenges, bewusst neutral bleibendes Menuett. O come chiare e belle ist ein „Gelegenheitswerk“, das einen direkten Zusammenhang mit Ruspolis Beteiligung am spanischen Erbfolgekrieg hat. Papst Clemens XI. hatte den Thronanwärter der Bourbonen, Philip V., als König von Spanien akzeptiert, damit den Habsburger Erzherzog Karl zurückgewiesen und so den Zorn dessen Bruders, Kaiser Joseph I. von Österreich, auf sich gezogen. Im Juni 1707 sicherten die kaiserlichen Truppen das Königreich Neapel für die Habsburger Sache, so dass der Papst, da Mailand sich bereits unter österreichischer Herrschaft befand, in eine sehr prekäre Lage gebracht wurde. Im Mai 1708 besetzten die kaiserlichen Truppen die päpstliche Stadt Comacchio an der Adriaküste und drohten mit der Annexion des nahe gelegenen Ferrara sowie anderer päpstlicher Territorien. Der Papst protestierte, jedoch ohne Erfolg. Im August hatte er dann keine andere Wahl mehr, als seine eigenen Truppen aufzustocken um Ferrara zu verteidigen und, wenn möglich, Comacchio zurückzuerobern. Der ehrgeizige Ruspoli bot sofort seine Hilfe an, indem er ein Regiment von 1200 Männern zur Verfügung stellte. Ferrara wurde entsprechend verteidigt (obwohl Comacchio bis zum Ende des Krieges besetzt blieb) und Ruspoli erhielt seine erhoffte Auszeichnung: im Februar 1709 erhielt er den Titel „Prinz von Cerveteri“. Händels Kantate wurde am 9. September 1708 aufgeführt und bejubelt den Augenblick, in dem Ruspoli dem Papst seine Hilfe anbot. Es treten drei Figuren auf. Der Hirte Olinto (Sopran) stellt Ruspoli selbst dar (Olinto war sein „arkadisches“ Pseudonym); der Tiber (Alt) repräsentiert Rom und die allegorische Figur der Gloria (Sopran) scheint Rom dazu zu inspirieren, ihre alte Größe wiederherzustellen. In der Metaphorik des Textes soll diese Wiederbelebung unter der Leitung eines „milden Sterns“ stattfinden, der natürlich Papst Clemens selbst ist. In dem Werk sind wahrscheinlich mehrere solcher aktueller Anspielungen, die heute unverständlich sind, hervorgehoben sei jedoch, dass die Verweise auf „alba“ („Sonnenaufgang“) auch auf Clemens anspielen (dessen Familienname Albani war) und dass die beiden Flüsse Ister und Orontes jeweils das österreichische und das türkische Kaiserreich darstellen. („Ister“ ist der klassische Name für die Donau; Orontes war der Hauptfluss Syriens. Obwohl die Türkei am Krieg nicht direkt beteiligt war, war sie doch dem Papsttum stets feindlich gesinnt.) Die Bemerkung, dass „die Lanze des Jupiter mit Mars vereint“ sei sowie die Aussage, dass Urania und Clio (die Musen der Astronomie und der Geschichte) nicht lügen könnten, lassen darauf schließen, dass in der Zeit eine Konjunktion der beiden Planeten stattgefunden haben könnte, zwischen Juli 1707 und September 1709 war dies jedoch nicht der Fall. Die Musik sprüht nur so vor geistreichen Einfällen. Eine kurze und bündige Eröffnungssonata leitet direkt über in Olintos erste Arie; das Bild des im Licht des „milden Stern“ schimmernden Tibers wird durch zarte, einander überlappende Violinfiguren evoziert. Das Erwachen des Tibers („Chi mi chiama?“) wird von einer punktierten Basslinie begleitet, die Händel später noch einmal in der Oper Alcina verwendete, und die folgende, lebhafte Arie in g-Moll („Più non spera“) wurde zurecht für Il Pastor Fido wiederbelebt. Die erste Äußerung der Gloria ist überraschenderweise eine langsame Arie mit einer ungeheuer verzierten Vokallinie, in der sie Rom für seinen traurigen Zustand leise tadelt. Der Glanz kehrt jedoch mit „Tornami a vagheggiar“ zurück, wo die strahlende Melodie zum ersten Mal erscheint, die durch die Arie aus Alcina, die mit denselben Worten beginnt, wohl am berühmtesten geworden ist. (Die Ritornelli kehren in der Arie „E pur bello“ in Teseo wieder.) Die nächste Arie Olintos bezieht sich auf den Kriegsalarm, der die Helden des alten Roms erregte. Um jedoch den Höhepunkt nicht vorwegzunehmen, arbeitet Händel hier nicht mit den üblichen Stilmitteln, sondern setzt das Stück als formelles Menuett. Nachdem Gloria den „milden Stern“ geradezu ekstatisch gelobt hat, erklärt Olinto, dass er seine Schäfer-Flöten gegen eine Kriegstrompete eintauschen will. Händel fügt der letzten Arie eine richtige Trompete hinzu, was einen brillanten Effekt hat. Das Werk endet mit einem kurzen coro der drei Sänger.